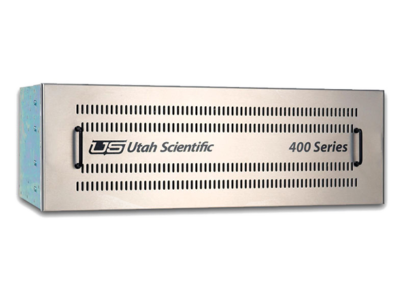 The UTAH-400 Series 2 routers are designed to provide a single platform for all signal formats including those used in IP networks. Each router is based on a unique hybrid architecture, making it ideal for even the most complex signal management environments. Robust tools for switching and processing signals drive a complete, integrated, and flexible system for the facilities of today and the future. The UTAH-400/DATA Router is a 64-port RS-422 router designed to switch machine control data in conjunction with the audio/video signal routing layers of a UTAH-400 Digital Routing Switcher System. Each 3RU frame carries a single switch card that serves 64 data ports. A high-speed data bus arrangement is provided to connect up to four frames together to form larger routers with up to 256 ports. 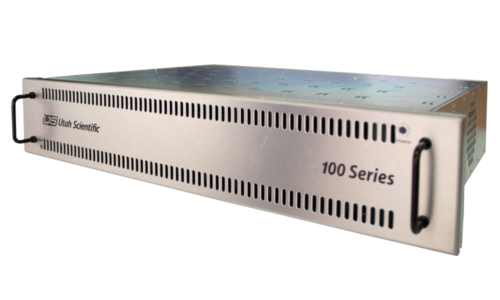 The UTAH-400/TC Router is a 64×64 router designed for routing timecode data in conjunction with the audio/video signal routing layers of a UTAH-400 Digital Routing Switcher System. Each 3RU frame carries a single switch card that serves 64 input ports and 64 output ports. A high-speed data bus arrangement is provided to connect up to four frames together to form larger routers with up to 256 x 256 ports.